The most talented robot designers from across the globe have come to the 1st Annual Robot Tournament sponsored by the billionaire, Mr X. Traveling from Japan, Canada and the United States, the designers have brought their finest cybernetic creations to do battle in a series of tests to see which robot can claim the title of "The Most Powerful Robot In The World." "Ladies and Gentlemen... I wish to thank you all for coming to see the final event of my 1st Annual Robot Tournament. As you know, I have kept the final event of the tournament a secret. This event will test the strength, skill and intelligence of each of these fine robots. In fact, it will also test the strength and skill of each one of you. That may seem strange, but I'm sure you will understand when I explain that the final test for these robots is to help me conquer the world! "Please excuse me and my robots as we teleport out of here, but we have a lot of work to do. But don't worry, you'll see me again soon. Real soon!" --From the NES Mega Man 6 instruction manual. Play Mega Man 6 Now! The First Annual Robot Tournament has begun, held by Mr. X, the notorious billionaire. Dr. Light, who did not participate, sent Mega Man to watch over the tournament. After the top eight robots had been named, Mr. X explained that the winning robots have been reprogrammed and are now going to lead Mr. X's robot army to take over the world. Now Mega Man must once again jump into action with his dog Rush and his bird Beat. 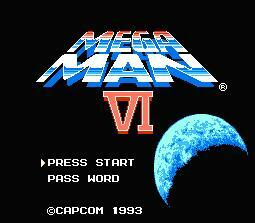 Mega Man 6 is the last of the classic series to appear on the NES. The graphics have improved from the previous game, most prominently a new intro effect for the Robot Masters. This game is also the first of the Mega Man series where two of the robot masters were designed by non-Japanese. The music keeps to the classic feel, however it is improved and sounds smoother than previous games. This game brings back Mega Man's trusty sidekicks Rush and Beat. Rush, your robotic dog, helps you jump higher, fly, and turns into a sub for underwater exploration. He has been given a new upgrade, he turns into a suit of armor which allows you to punch through cracked walls but gives limited range on attacks. Beat, the robotic bird created by Dr. Cossack, also rejoins your side, flying into enemies and keeping you from falling down into pits. In this game, you only have to find the letters B.E.A.T. to get Beat to join you. Fight your way through the eight stages and collect power-ups that boost your health and weapon energy. Don't forget to collect extra lives and E-tanks, which allow you to refill your health when you need it, as well. At the end of each stage, fight the boss and take their powers, such as Knight Man's Ball and Chain or Flame Man's Fire Geyser, which can be selected in the menu. The Robot Masters are similar in size to our hero and have the same life bar, however they do more damage then Mega man does with his Mega Buster. One should not just run in with buster blazing, because each Robot has a weakness to a certain weapon, and these weaknesses should be discovered. Each of the robots also have a fighting pattern which should be learned for an easier victory. These Robot Masters include: Blizzard Man, Wind Man, Flame Man, Plant Man, Tomahawk Man, Yamato Man, Knight Man, and Centaur man. Once all the robots have been defeated, make your way to Mr. X's fortress and defeat him. Good luck player, and lock and load!